Most of you know me from the famous arcade game hit that was published in 1983 but this is just a small part of my history! Where should I start? I was born in 1911 on a far away planet called Q*ba located in the Pleistozaen galaxy. That is around 500 lightyears away from this galaxy, the Milky Way. My home planet Q*ba is around 8 times in size and 3 times as hot as planet earth. It looks a lot like planet Mars with giant deserts and red sandy rocks. Due to its heavy volcanic activity, the surface is extremely hot, our species could only survive because of our highjump skills that we improved over our million years of evolution! We even jump while asleep! There are only three known small holiday resorts on the planet where the surface is cold enough to rest for a few seconds without getting burned. Unlike creatures on planet earth little Q*bert babies do not climb outside of female creatures. Also we do not lay eggs, we are not Easter bunnies! Our species spawns though pathogenesis! 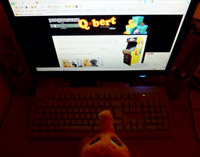 Anyway I was reproduced by a tall 66 years old Q*bert and raised by a couple of other Q*berts that lived in our horde. They gave me love, warmth, food and everything else that a small little Q*bert needs to grow up fast. I went to primary school in the 1930s and later began studying rolling lawns physics. Due to my skills I soon became a real pro and created my own roll lawn breeding that I grew on a special plant. My rolling lawn resists temperatures up to 120 degrees! So everyone was able to put it at his home garden and enjoy walking on it without getting burned. A milestone! The sad story: volcanic activity increased in the 60s and our species had to move to the mountain regions to avoid extinction. It was then when I started to study Balistics and Spacecraft Engineering. It was unavoidable that our beloved home planet was close to collapse. In the late 70s I was able to build an Escape Capsule based on a brilliant shifting theory by Victor Schauberger, a German scientist. You may ask yourself how I could get hold of this information. It is that easy: One of his test projectiles found its’ way to Q*ba in the late 60s and was found in a desert area that we call area 68. This Schauberger Levitation Theory was a breakthrough in the history of our species. Besides this the projectile also provided information about planet earth and how to get there! There was no doubt, our species could only survive in a big escape to a planet that provides the same content of air and climate minus the enormous temperature. Planet Earth must have been the best choice for our unavoidable exodus! In the late 70s every available Q*bert was forced to work in Q*ba's Ore Mines to dig for a special ore that was needed to build as much escape capsules than possible! It was a true race against time! In 1981 we managed to build 138.021 of these capsules each of them to house only one Q*bert and providing food for at least 1 1/2 years! Q*bert is an arcade video game developed and published by Gottlieb in 1982. It is a platform game that features two-dimensional (2D) graphics. The object is to change the color of every cube in a pyramid by making the on-screen character jump on top of the cube while avoiding obstacles and enemies. Players use a joystick to control the character. The game was conceived by Warren Davis and Jeff Lee. Lee designed the titular character based on childhood influences and gave Q*bert a large nose that shoots projectiles. His original idea involved traversing a pyramid to shoot enemies, but Davis removed the shooting game mechanic to simplify gameplay. Q*bert was developed under the project name Cubes, but was briefly named Snots And Boogers and @!#?@!? during development. The title character Q*bert hops down the pyramid to avoid Sam and Coily. Q*bert is an isometric platform game with puzzle elements where the player controls the title protagonist from a third-person perspective. Q*bert starts each game at the top of a pyramid of cubes, and moves by jumping diagonally from cube to cube. Landing on a cube causes it to change color, and changing every cube to the target color allows the player to progress to the next stage. In later stages, each cube must be hit multiple times to reach the target color. In addition, cubes will change color every time Q*bert lands on them, instead of remaining on the target color once they reach it. Jumping off the pyramid results in the character's death. The player is impeded by several enemies: Coily, a purple snake that chases after Q*bert; Ugg and Wrong-Way, purple creatures that run along the sides of the cubes; and Slick and Sam, green gremlins that revert the color changes that have occurred. A collision with purple enemies is fatal to the character. Colored balls occasionally appear at the top of the pyramid and bounce downward; contact with a red ball is lethal to Q*bert, while contact with a green one will immobilize the on-screen enemies. 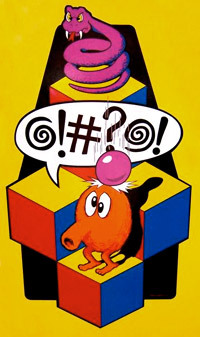 Upon dying, Q*bert emits a sound likened to swearing. A multi-colored disc on either side of the pyramid serves as an escape device from danger, particularly Coily. The disc returns Q*bert to the top of the pyramid, tricking Coily to jump off the pyramid if the snake was in close pursuit. The Gottlieb staff had difficulty naming the game, and, aside from the project name "Cubes", it was untitled for most of the development process. The staff agreed the game should be named after the main character, but could not agree on a name. Lee's title for the initial concept—Snots And Boogers—was rejected, as was a list of suggestions compiled from company employees. Vice president of marketing Howie Rubin favored @!#?@! ?, although the rest of the staff felt it was not viable. Staff members argued it was silly and would be impossible to pronounce. A few early test models, however, were produced with @!#?@!? as the title on the units' artwork. During a meeting, "Hubert" was suggested, and a staff member thought of combining "Cubes" and "Hubert" into "Cubert".Art director Richard Tracy changed the name to "Q-bert", and the dash was later changed to an asterisk. In retrospect, Davis wishes the asterisk was changed to a different character; the asterisk prevented the name from becoming a common crossword term and it is a wildcard character for search engines. 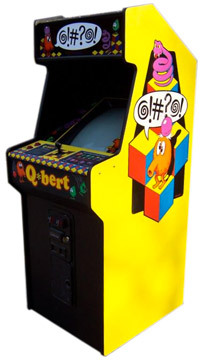 Q*bert was Gottlieb's only video game that gathered huge critical and commercial success, selling around 25,000 arcade cabinets. Cabaret and cocktail versions of the game were later produced.The machines have since become collector's items; the rarest of them are the cocktail versions. Author Steve Kent and GameSpy's William Cassidy considered Q*bert one of the more memorable games of its time. Author David Ellis echoed similar statements, calling it a "classic favorite". 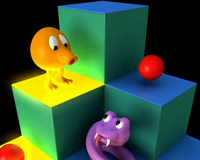 1UP.com's Jeremy Parish included Q*bert among the higher-profile classic games. In 2008, Guinness World Records ranked it behind 16 other arcade games in terms of their technical, creative and cultural impact. Video game critics focused on the gameplay and visuals. Author John Sellers also called Q*bert addictive, and praised the sound effects and three-dimensional appearance of the graphics. Computer and Video Games magazine praised the game's graphics and colors. Cassidy called the game unique and challenging; he attributed the challenge in part to the control scheme. IGN's Jeremy Dunham felt the controls were poorly designed, describing them as "unresponsive" and "a struggle". He commented that despite the controls, the game is addictive. William Brohaugh of Creative Computing Video & Arcade Games described the game as an "all-round winner" that had many strong points. He praised the variety of sound effects and the graphics, calling the colors vibrant. Brohaugh lauded Q*bert's inventiveness and appeal, stating that the objective was interesting and unique. The main character also received positive press coverage. Edge magazine attributed the success of the game to the titular character. 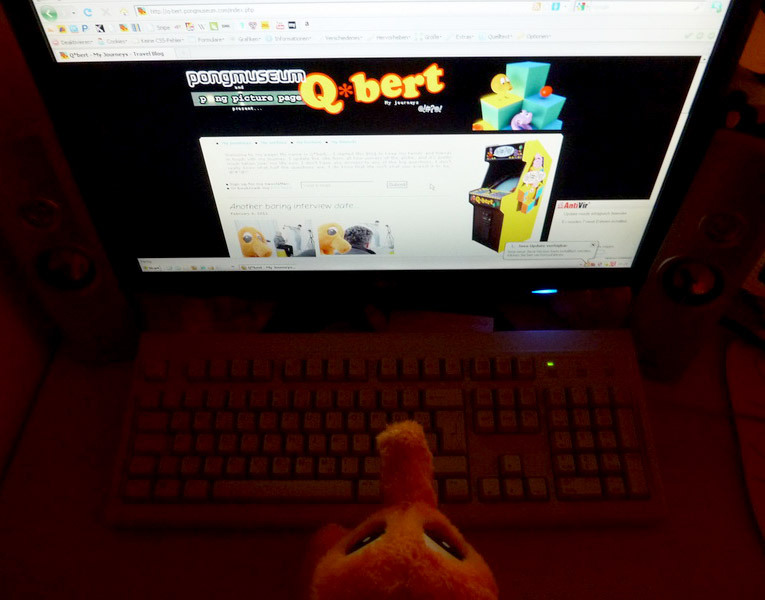 They stated that players could easily relate to Q*bert, particularly because he swore. Computer and Video Games, however, considered the swearing a negative, but still felt the character was appealing. Cassidy believed the game's appeal laid in the main character. He described Q*bert as cute and having a personality that made him stand out in comparison to other popular video game characters.